(March 29, 2017) -- The University of Texas at San Antonio (UTSA) College of Public Policy (COPP) and the League of Women Voters of the San Antonio Area are partnering to host the San Antonio City Council District 5 Forum on Monday, April 3 from 6 p.m. to 8 p.m. at the UTSA Downtown Campus, Aula Canaria Lecture Hall in the Buena Vista St. Building (BVB 1.328). District 5 Council candidates Shirley Gonzalez, Cynthia T. Cavazos, David C. Yañez, Richard Montez, Daniel Lopez and Dolores Sotomayor are expected to attend and discuss their positions on issues facing San Antonio today. There will also be a question and answer session where voters will be able to ask questions of the candidates directly. The forum is part of an ongoing collaborative partnership between COPP and the League of Women Voters of the San Antonio Area to inform the public about policy and civic engagement opportunities. "The city elections are so important to how we live our everyday lives that we want voters to have as much information about the candidates as possible," said Phyllis Ingram, director of voter services for the League of Women Voters of the San Antonio Area. 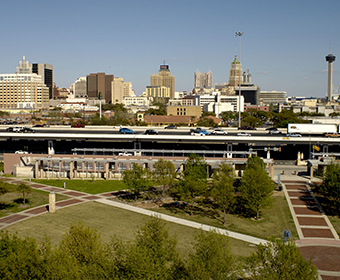 District 5 is the home community for the UTSA Downtown Campus and its neighbors. "We hope citizens and students will take this opportunity to get to know the candidates and their positions in order to cast an informed vote," said Francine Romero, associate dean and associate professor with COPP. "It is important to the College of Public Policy that we are able to host this event for the public since District 5 is our home community too. We are excited to welcome our neighbors and friends to our beautiful campus and hear from the candidates directly." The City election is Saturday, May 6. Registered voters will have the opportunity to elect the mayor of San Antonio, ten council members and vote on six bond propositions. Free parking will be available in Lot D-3 under IH-35. Learn more about the League of Women Voters of the San Antonio area.